Tom Watson’s hunt for Trotskyists does more than misrepresent Corbyn’s movement — it opens the door to attacks on party democracy. It feels like the 1950s in the Labour Party. A week that began with important victories for Jeremy Corbyn in the High Court and National Executive Committee elections has ended with a witch-hunt of sorts. The campaign is not surprising. Like many of the attacks waged on Corbyn by the Labour right this line has been deployed before, more effectively, by the Tories. What gives Watson’s allegations greater weight, however, is not their substance but their implications. In conjuring a Trotskyist conspiracy behind the Corbyn movement, his aim is broader than misrepresenting the politics of hundreds of thousands of Labour supporters. If left unchallenged, Watson’s McCarthyism will pave the way for attacks on party democracy and far greater policing of political opinion. First, the substance. Let’s begin by stating the obvious: there have long been Trotskyists in the Labour Party and outside Trotskyist organizations have always made pronouncements about internal Labour matters. It seems obvious that some have joined the party since Jeremy Corbyn was elected. As the dominant party of the working-class in Britain, there are plenty of reasons for the far left to relate to Labour. But how significant is this? To get a sense, consider the numbers involved. Reliable estimates would put the total active membership of the two largest Trotskyist parties in Britain — the Socialist Workers Party and Socialist Party — at a little over three thousand combined. Smaller organizations count their members in the hundreds, or dozens. In total, Trotskyist organizations in Britain have somewhere between five and ten thousand members. By contrast, under Corbyn’s leadership, the Labour Party has increased its rolls from two hundred thousand at the end of Ed Miliband’s term to something approaching six hundred thousand today. If we were to accept that one thousand Trotskyists had escaped the clutches of the compliance unit and joined — they haven’t, this guess is far too high — that would mean 0.25 percent of the new members were entryists. Some infiltration. And what about Watson’s other allegation, the “arm-twisting” by “old hands” that is leading impressionable young members astray? 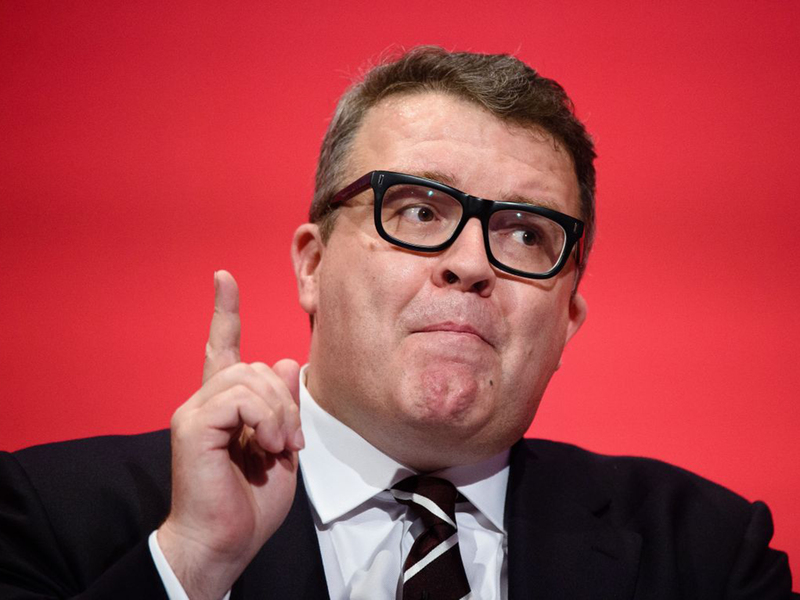 In his dossier, Watson provides no evidence whatsoever of Trotskyists in positions of influence in the Labour Party. Instead, he focuses on people attending local meetings, phonebanking, and organizing in affiliated trade unions. These kinds of grassroots activities simply do not come close to meriting the pied piper status he implies. He goes on to mention Momentum specifically. So who might the “old hand” be leading that campaign? Its chair, Jon Lansman, is certainly an experienced organizer. But Lansman is not a Trotskyist or an entryist — he led Tony Benn’s campaign for deputy leader back in 1981, a decade before Tom Watson became active in the party. Momentum’s second most influential figure, national organizer James Schneider, hardly fits the bill either. Far from a Trotskyist, he is recovering from a lambasting in the press for previously having supported more right-wing political parties. These are far from the only inaccuracies in Watson’s claims. For instance, one of the five points in the dossier refers to an alleged Socialist Workers Party “training course to infiltrate Labour.” But when you examine the document, it makes clear that this is not what the SWP advocates at all. “We are not members of the Labour Party,” it says, “as we believe an independent revolutionary socialist organisation.” It goes on to suggest work “alongside” Labour members. A glance at party materials reveals that its leadership considers membership in the Labour Party incompatible with membership in the Socialist Workers’ Party. This kind of error is unsurprising when one considers that the Labour right have described Corbyn as both an anarcho-syndicalist and a Marxist-Leninist in recent weeks. The Tories probably have a better grasp of left-wing politics. But when you dig a little deeper into Watson’s sources, it becomes clear why he gets so much wrong. At the end of his dossier he claims to quote from a book by Michael Crick about a manual from the Militant Tendency. Except he doesn’t — the quote he uses, word for word, comes from a review of that book by the Blairite pressure group Progress. An interesting source to use when complaining about parties within a party. Indeed, at the same time as this controversy erupted, leading Progress supporter John McTernan was using his column in the Daily Telegraph to call for the Tory government to crush the rail unions. This same party member has previously called for the National Health Service to be privatized, Iraq to be reinvaded, and public libraries to be closed. Despite this, he is an almost-daily presence on television defending the Labour right. No questions have been raised about his Labour membership. Clearly, right-wing opinions are not treated with the same suspicion. All this is to say that Tom Watson’s attacks have limited basis in reality. Jeremy Corbyn is not leading a revolutionary movement. He’s fighting to revive Labour around a moderate social-democratic program. So why is Watson associating him with Trotskyism? Part of the reason, no doubt, is the reputation British Trotskyist parties have earned (some fair, some unwarranted) for sectarian behavior in the labor movement. If Corbyn could be painted as soft on them it might discourage a layer of his supporters. The problem for Watson is that his faction of the Labour Party has been engaging in behavior that would make even the most sectarian Trotskyist blush. If you want conspiracies, you’d struggle to find a more obvious one than the recent party coup, which was not only planned weeks beforehand but coordinated so resignations occurred on-the-hour, every hour in the national press. It also hinged on a vote of no confidence in Corbyn as leader, for which there is no basis in the party’s own rules. It would be hard to imagine more a more anti-democratic maneuvers than banning local party meetings for months on the basis of unverifiable claims of harassment. Except maybe the summary suspension of entire constituency branches for being too supportive of Corbyn. And what about purges? Has any Trotskyist organization ever illegally removed 130,000 members from its voting rolls? Or increased the fee to vote eightfold overnight to prevent people from participating? It should be clear to any objective observer which wing of the party poses the greatest threat to Labour members. Watson himself made no attempt to disguise his broader aims. In the same interview with the Guardian he made clear that he wanted to change the mechanism for electing the party leader to drastically reduce the input of the membership. What better way to legitimize this than to engage in a red scare? This kind of McCarthyism is nothing new — it has a sordid history in the Labour Party. One prominent incident, in 1960, saw Hugh Gaitskell use his speech at party conference to brand opponents of nuclear weapons “fellow travellers” of the Soviet Union. In the decades that followed numerous MPs were subject to allegations, based on tip offs provided by Mi5, of spying for the USSR. One was even driven to suicide by the campaign. None of the allegations were true. This is what real political bullying looks like. When Watson talks about being “reliably informed” about nefarious behavior, when he compiles dossiers, when his friends in party headquarters make clear they are trawling through members’ social media accounts, it should provide a chilling reminder of those days. It can now be said without any doubt that establishment figures in the party are gathering intelligence on their political enemies. It is far from clear how extensive this exercise is or how it can be held accountable. As with all red scares, the real danger is not the socialist bogeymen. It is the climate of fear and suspicion that this process creates, one designed to make Labour members think again about expressing radical ideas or challenging the authority of party elites. It is no coincidence that this is happening during a profound crisis, when people are beginning to question the system, with thousands on the streets supporting a left-wing leader and polls showing stronger support for socialism than capitalism. That, rather than any Trotskyist party, is the specter that haunts Tom Watson.